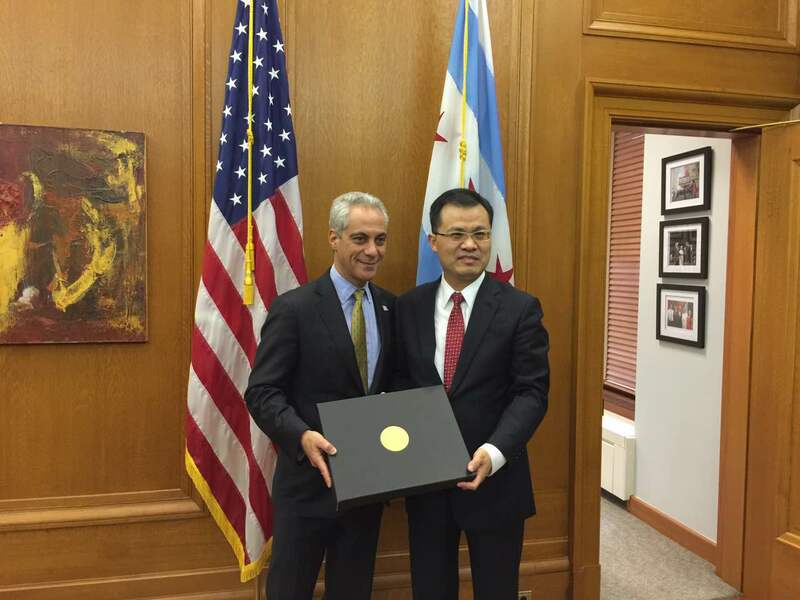 On April 13, Mr. Zhao Weiping, Chinese Consul General to Chicago, paid a farewell call on Mr. Rahm Emanuel, Mayor of the City of Chicago, at the City Hall. Deputy Consul Generals Wang Yong and Liu Jun were at the meeting. Zhao expressed his heartfelt gratitude to Mayor Emanuel and the City Government of Chicago for their great support to the Consulate General and himself and highly appreciated Mayor Emanuel’s strong commitment to developing friendly relationship between Chicago and China. Zhao pointed out that Mayor Emanuel has pushed Chicago-China relationship to a new level with great vision and enthusiasm. China and Chicago, enjoying frequent high-level exchanges, have never been so deeply connected in the areas of trade, investment, education, culture and tourism, which has brought tangible benefits to the people of both sides. In particular, Chicago has become the first US city that has established Joint Working Group on Trade and Investment Cooperation with eight Chinese cities and had citywide celebrations of Chinese New Year in the name of City Government during the past three years. All these demonstrated that Chicago, a model of China-US sub-national cooperation, has become a herald city in developing relations with China. Zhao said that China attaches great importance in further promoting friendly exchanges and practical cooperation with Chicago and wished bilateral relations make further progress in the future. Mayor Emanuel, while positively valuing Zhao’s efforts in promoting friendly relationship between China and Chicago, expressed his satisfaction with the sound development of bilateral relations in recent years and commitment to further advancing Chicago-China relationship. Consul General Zhao Weiping concluded his posting in Chicago and departed for China on April 26, 2016.